The BC government has announced that it will conduct independent review to find best solution for George Massey corridor. There was an opinion piece by Vaughn Palmer in the Vancouver Sun yesterday which did not give anything like a balanced coverage. The protest is against spending far too much money on a “solution” that we know will not work. Not against doing something about people currently experiencing long delays to get through the tunnel at some times of day. 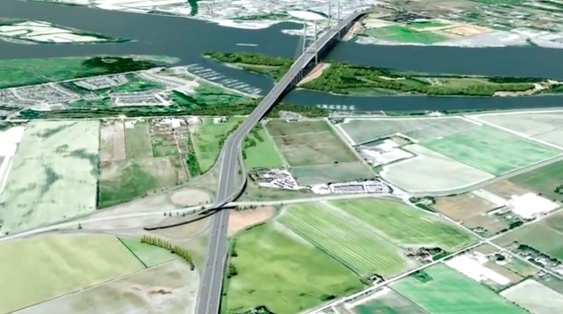 Groups like Fraser Voices have been concerned that the bridge was decided on in the Premier’s office – and all the effort since then has been to justify a quixotic choice. All the other options – including sticking to the BC Liberals’ previous plan – are simply ignored. And then they lie about the port’s intentions to deepen the ship channel. So I wrote a Letter to The Editor. I am putting this out here now because I think it is very unlikely to be published. Vaughn Palmer’s characterization of the protest at the tunnel ceremony is not accurate. There are real alternatives to the $3.5bn vanity project that have not been adequately examined. In the longer term, congestion can never be solved by widening roads. Never has done, never will do. All that does is move the line-up to somewhere else. The only way to reduce car traffic is to increase transit service. One bus can carry many more people in a given length of road than cars can. The province has already invested in bus lanes both sides of the tunnel but service needs to be increased. And when that isn’t enough, add another tube on the river bed carrying light rail. As for the claim that the “full freight will be covered by tolls”, it has not worked for the Port Mann or the Golden Ears. Why would the Massey replacement be any different?